1 of 3 Pat chicken dry with paper towels. Place flour on a plate. Coat chicken in flour, shaking off excess. Heat oil in a large nonstick skillet over medium-high heat. Cook chicken for 12 minutes or until browned, turning halfway. 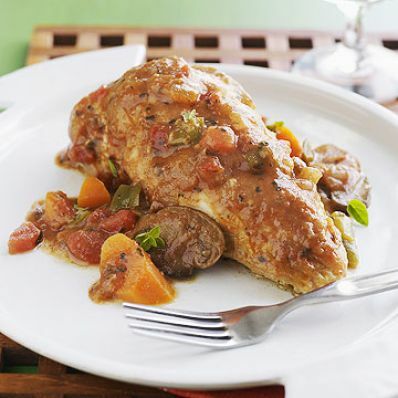 2 of 3 Remove chicken from skillet and place in slow cooker bowl. Place mushrooms in skillet; cook over medium-high heat for 6 minutes. 3 of 3 Place mushrooms in slow cooker, and add green pepper, onion, carrot, tomatoes, wine and Italian seasoning. Cook on HIGH for 3-1/2 hours or LOW for 5 hours. Stir in basil, pepper and salt and serve immediately.